Cynthia Barnett's Rain begins four billion years ago with the torrents that filled the oceans, and builds to the storms of climate change. It weaves together science--the true shape of a raindrop, the mysteries of colored rains--with the human story of our attempts to control rain, from ancient rain dances to the 2,203 miles of levees that attempt to straitjacket the Mississippi River. It offers a glimpse of our "founding forecaster," Thomas Jefferson, who measured every drizzle long before modern meteorology. Two centuries later, rainy skies would help inspire Morrissey's mopes and Kurt Cobain's grunge. 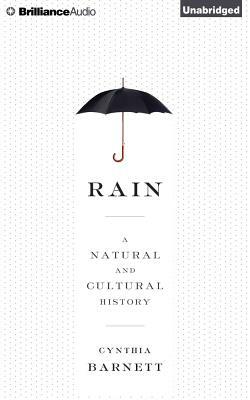 Rain is also a travelogue, taking readers to Scotland to tell the surprising story of the mackintosh raincoat, and to India, where villagers extract the scent of rain from the monsoon-drenched earth and turn it into perfume. Now, after thousands of years spent praying for rain or worshiping it; burning witches at the stake to stop rain or sacrificing small children to bring it; mocking rain with irrigated agriculture and cities built in floodplains; even trying to blast rain out of the sky with mortars meant for war, humanity has finally managed to change the rain. Only not in ways we intended. As climate change upends rainfall patterns and unleashes increasingly severe storms and drought, Barnett shows rain to be a unifying force in a fractured world. Too much and not nearly enough, rain is a conversation we share, and this is an audiobook for everyone who has ever experienced it.